Omron 3 Series arm monitors are priced competitively and are affordable. They have all the basic features to get the job done. If you are looking for a simple monitor with few features and one-touch operation and priced within $40, then go for 3 series Upper Arm Blood Pressure Monitor – BP710N. If you are looking for a more feature-rich model you should look at Omron 10 series or Omron 7 series. BP710N is the successor of BP710, which was discontinued in favor of BP710N. We recommend checking price for all models as sometimes you might get better model at lesser price. BP710N is almost identical to its predecessor BP710. Newer model comes with a wide-range D-ring cuff supporting arm size from 9” to 17”. The previous model by default supported 9” to 13”, though the model was compatible with large adult cuff ranging from 13” to 17”. Most of the other features are available in both the models. Even though some stores still sell BP710, we recommend BP710N as it is better and in most cases cheaper. Omron blood pressure monitors comes with Omron’s Advanced Accuracy, which ensures consistent and precise reading. Wide range D-Ring contoured cuff is very comfortable. It supports arm circumference from 9” to 17”, which is appropriate for standard and large adult arm. The Omron 3 series monitor has a large digital display, which makes the reading visible and easier to read. The device is handy and can be used to monitor their blood pressure at home, work or anywhere else. One-touch operation: This Omron device is having one touch-operable button. With the single click, the cuff is inflated and show systolic, diastolic and heart beat measurements. Irregular Heartbeat Detector: While measuring blood pressure, It detects fluctuations or irregular heartbeats. Irregular heartbeats are concerning, thus this feature will help you to seek early medical attention. Memory Storage: Reading are stored with date and timestamp which can be retrieved as needed. Omron 3 series arm blood pressure monitor have a memory capacity of 14 and only have single user mode. Low memory is one of the drawbacks as other Omron models have capacity over 100 and can support two users. The cost of the Omron 3 series upper arm blood pressure monitor is very reasonable and have features that are enough to measure blood pressure. 4AA batteries (not included). AC adaptor is not supported. Omron have one of the best blood pressure monitors in the market. They understand the needs of the customers and build the devices around those needs. 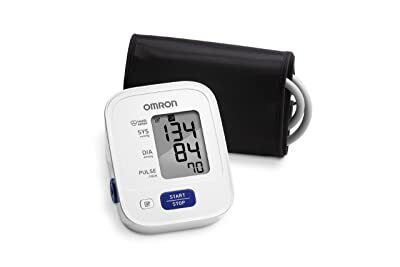 If you are looking for a family blood pressure monitor with more features such as wireless data transfer, multi-user mode and comfit cuff you should look at Omron BP786N, BP785N or Omron BP761N, BP760N. The 3 series have few features but enough for the daily needs. In budget range, this is one of our top recommendations. I only received Spanish instructions in the box. Is there an online manual available? I bought this at Walmart 11 months ago. I have had nothing but trouble. This monitor was 20 counts more than my dr.’s. The dr. changed my meds 4 times till we realized it’s monitor that is off. I called Omron and was told I can not return for a refund. I can only send in to be looked at. I need it now. Omron then told me to return it to Walmart. It is outside the 90 day return policy. So I am stuck. I will never buy another Ormon.